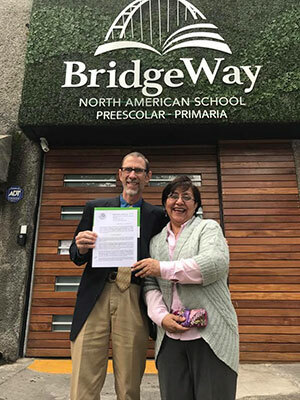 BridgeWay North American School in Mexico City was left completely undamaged by the September 19 earthquake, according to Rick Kilbrai, board member, parent, CMA worker, and volunteer facility coordinator for Bridgeway. However, the faculty was not untouched by the natural disaster. Rick reported that three BridgeWay teachers and Director David Brownrigg are not able to move back into their homes and are having trouble finding new places to live. Three families of the CMA missionary team are in the same situation, and finding new homes for them is challenging and expensive. “Currently, all schools in our neighborhood are closed because we are in a zone that was greatly affected and there are still many roads closed. As of yesterday, only 1 percent of the schools in the city were open,” he reported on Tuesday, September 26. 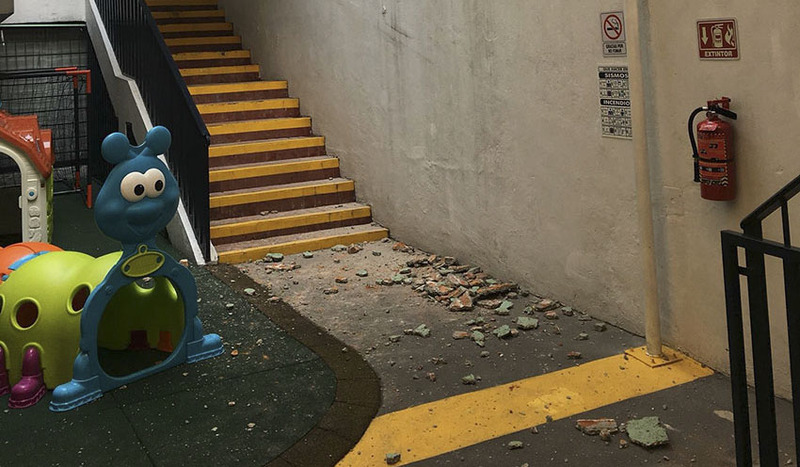 A piece of cement came off the building beside the school and landed near the stairs that lead to the school patio, Rick explained. (pictured above) “As a preventative measure, we will be constructing a metal roof structure over the stairs. The architects are still working on the drawings and we hope to have them tomorrow (September 27). Then builders will build the structure. We are praying that all this can happen before Monday when schools in our zone will likely open, but that timing will be very, very tight,” he continued. 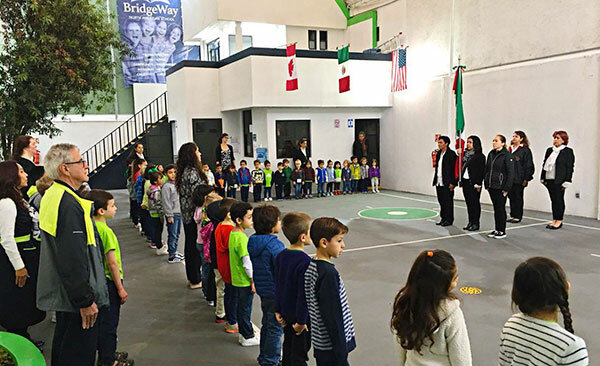 Editor’s note: Lisa Brownrigg sent us the following article about BridgeWay’s opening before the 7.1 earthquake hit Mexico City on September 19. The first day of school for BridgeWay in Mexico City finally arrived! The Lord worked us through so many problems, so many potential disasters. In spite of being on the precipice of failure, BridgeWay opened its doors on August 21, 2017. Parents walked children into the school and they were greeted by friendly teachers. Books lay ready on desks to be devoured, backpacks were stowed, children sat down to desks correctly sized. Later on, the children ate their lunch on the patio then kicked the soccer ball and played other games at recess. All that was going on was a typical, normal scene being played out in any school across Canada, the United States, and Mexico. Only we aren’t typical. We have a mission within a mission: to change a country one student, one family, one neighborhood, one community and one city at a time. Our tally of students was 55 on opening day, but one week later we were at 59. We have the correct zoning to have a school. We have accreditation for our preschool from SEP, the government entity in charge of education, and the primary grades accreditation should arrive soon (Director David Brownrigg and Spanish Director Gina Cruz pictured with certificate). We have playground equipment, whiteboards, and desks that fit the children. We didn’t have all these things even one week before school started. Also, the teachers have a refrigerator and a microwave. We have trash cans throughout the school. A school was formed in the heart of Mexico City based on the heart of the Lord and it formed because our God worked out miracle after miracle after miracle. The number of these miracles cannot be counted. Praise God for His faithfulness!